Today at 4.45pm a Southerly weather bomb hit. Heavy rain with strong winds and a temperature drop of 10 degrees occurred within half an hour. It took about an hour for reports to filter through. Damage to roofs (St Bernards College Waterloo Road lost roof sheeting) trees and fences down, power outages, surprised many with the verocity of the front. A tree down on the rail lines between Woburn and Waterloo railway stations caused about 2 hour delays to commuters returning from Wellington. By 7pm the front had passed with clear skies opening up over the valley. Other photos here from around Wellington. Thursday night brought heavy downpours across the entire Hutt Valley with surface flooding in several areas including the old Hutt Road reported from early morning. The Open Polythechnic was hit by two slips during the night which sent dirt and trees into the building on its eastern side. Lower Hutt experienced the highest recorded rainfall in the region with 69mm from 8pm last night to 8am this morning. Further heavy rainfall was experienced in late morning as well. Conditions are not expected to improve tonight with further heavy rainfall forecast in the Tararuas and again across the Valley, late Saturday also has more of the same predicted. Several events have been moved in anticipation of the weather including the Upper Hutt Highland Gathering a national Scottish festival has moved already to the wet weather alternative at Heretaunga College. At this stage there is no news on alternative arrangements for the Belmont Spring Festival (returning after a 10 year hiatus) but the wet weather alternative day is 31st October. Waiwhetu stream hit 2 year flood levels early Friday morning, but had abated by noon. Eastbourne flooding earlier in the morning. With steady rain falling from 11.00am yesterday, and several major falls throughout the afternoon the storm that hit the region unleashed its worst on certain areas of the Hutt Valley. Early indications via weather radar from Metvuw.com (excellent resource & service) showed the region was going to get some heavy rainfall. By all indications the worst bands of rainfall appear around Mid Valley from Silverstream through to Stokes Valley and further north in Upper Hutt. The impact was worst felt around 5pm onwards what with the combined rainfall and continuing heavy rain impacting on certain suburbs, Upper Hutt, Silverstream, Stokes Valley and the northern Lower Hutt suburbs were most affected. At 4pm the Hutt river was 1.3 metres high. By 6.30pm it had peaked at 4.3 metres at the monitoring station alongside Hulls Creek. At the Silverstream underpass a mother and three young children were trapped in rising waters, a fire engine rescued them by driving alongside and ferrying them to safety. The Eastern Hutt Road was roughly under about a metre of water in certain parts resulting from Hulls Creek breaching its banks and rising Hutt river flows. Around Stokes Valley several reports were coming in via our Twitter account of flooding of certain streets and access to Stokes Valley blocked, by people directly affected by the weather. Across the other side of the valley Sh 58 was closed due to minor slips. The Fire Service was very busy responded to 35 weather-related callouts and further to that the Rimutaka road was closed from 8pm to 9pm due to high winds and again minor slips the result of the weather onslaught. The biggest emergency of the night was the derailment of the Wairarapa train (5.33 from Wellington) at 6.20pm just north of Upper Hutt at Maymorn. 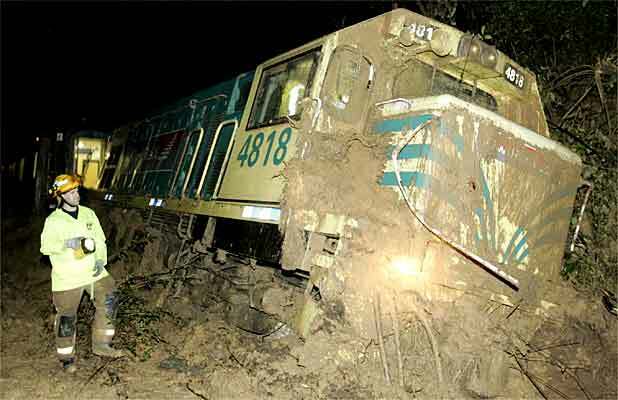 About 300 passengers were stranded in a tunnel after the Trains locomotive ploughed into a wall of mud and debris and derailed as it left a tunnel at Maymorn. The impact knocked the engine and one carriage about a metre off the tracks. Six other carriages stayed on the tracks but were stranded in the tunnel. No one was injured which given the time of night and number of people involved was extremely lucky. Passengers were stuck inside for more than 2 hours before being moved to the rear 3 carriages, which were pulled to Upper Hutt station by a second locomotive. They were then bussed to the Wairarapa, but again impacted by the Rimutaka Road being closed. It was quite fortunate that this incident was not a major disaster given the timing and weather influences. This no doubt was a harrowing incident for those involved as no doubt communication of the incident etc took time to emerge and the two hours in the dark and stormy conditions. But they are a hardy bunch those Wairarapa commuters. Today investigators are visiting the accident site and rail engine recovery is underway. KiwiRail says it wil be several days before the line is open, as the crash site is isolated, and the short timeframe and limited replacement buses cannot meet demand so today there is no Wairarapa service. It was an extremely wet and wild night, not to unfamiliar to the Hutt Valley but the given the timing of peak impact fortunate that fatalities were not involved, especially with regard to the rail incident. Thanks to everyone for their contributions last night and updates via Twitter and DM, it was busy. I hope that you were not to impacted by this weather incident. Todays weather unfortunately is a lighter version of yesterdays. Winter in the Hutt, probably a payback for last weekends brillant weather. PS Check back later as postings become available from Emergency service websites.